Loved for its rugged unspoiled coastline, Kangaroo Island is South Australia’s most famous tourist destination. Visitors enjoy the beauty of the untamed bushland and variety of the wild life, including koalas, wallabies, echidnas, fairy penguins, the exotic Australian sea lions and, of course the kangaroos from which the island takes its name. The pristine environmental conditions have meant that the island’s fresh seafood is eagerly sought after by some of the world’s most well-known chefs. The island’s famous marron, King George whiting and rock lobster are unrivalled. This island also produces some highly-regarded wines and there are excellent cellar door venues. Visiting Kangaroo Island is to step back in time and to enjoy a slower pace almost impossible to find in today’s busy world. Thorn Park on the island, is a modern beach house, set amongst three acres of local bushland that embodies privacy, space, luxury, superb views and tranquillity. Available to only one group. It is self–catering and provides one of the best venues to enjoy the magnificent food and wine; and so having great kitchen and entertaining facilities in your accommodation is important. Many choose not to move from the comfort and privacy of their accommodation, spending the time eating, drinking, sleeping and reading. Equally, however, for guests looking for an active and adventurous holiday, the breath-taking and wild environment is there for exploring — with swimming, diving, fishing charters, and much more. The accommodation offers three luxurious double bedrooms with ample privacy, several bathrooms, a well–appointed living and dining area, a smaller study and a spacious deck overlooking beautiful Penneshaw Harbour, the ocean, and distant views of the South Australian mainland. Thorn Park on the island is a world class beach holiday destination. At Thorn Park on the island, you can choose to stay at home, enjoy the view and read a book, or take in the many things that Kangaroo Island has to offer. Amazing seafood harvested in pristine waters, to excellent wineries and dining options, some of them in the quirkiest locations with incredible views, it is small wonder that a great proportion of guests return on a regular basis. Kangaroo Island is South Australia’s number one tourism destination! In addition to Thorn Park on the island we also have two other properties; Thorn Park in the City, located in inner city Adelaide, South Australia and Thorn Park by the vines, located in South Australia’s Clare Valley in the heart of one of South Australia’s most famous wine regions. 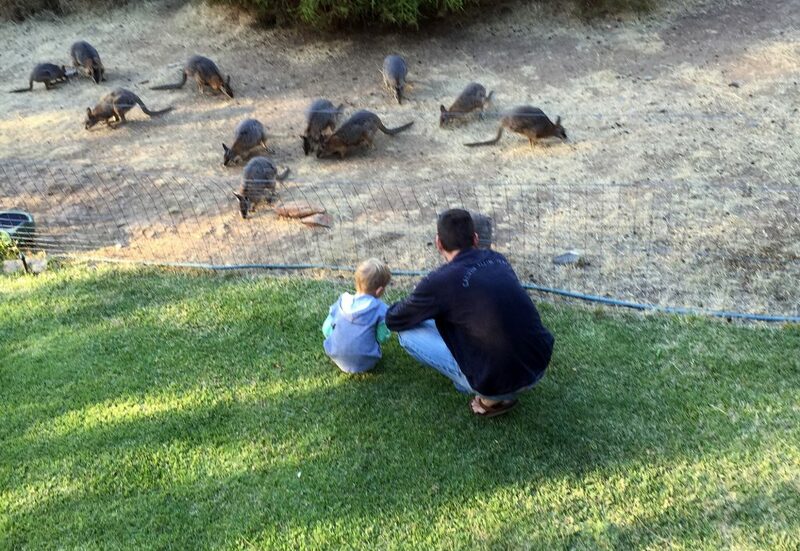 Can lead to making some charming new friends…like our family of wallabies!